Aerobic capacity is the ability of an athlete’s cardiovascular system to absorb and utilize oxygen. 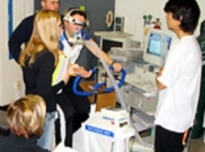 The VO2max Test measures the maximal oxygen consumption rate of an individual, which provides an indication of the individual’s maximal aerobic capacity. Lactate Threshold is the point during increasingly intensive exercise at which lactate begins to accumulate in the blood. This point is characterized by heavy breathing, a deterioration of form (run, cycling, etc) and a slight burn. In a laboratory environment we can obtain an estimation of the lactate threshold which can aid in setting training intensities. One measure of the effectiveness of an exercise and dietary regimen is in determining its effect on changes in body composition. 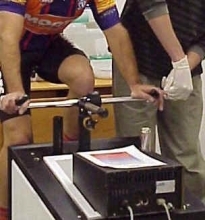 At SFSU Exercise Physiology Lab we have the ability to obtain body compositions measures in a variety of ways (1) “The Bod Pod,” a device that calculates body composition by measuring the volume of air displaced by an athlete’s body, (2) Hydrostatic weighing, and (3) Skin Folds.